Welcome to the Newburgh Lab! 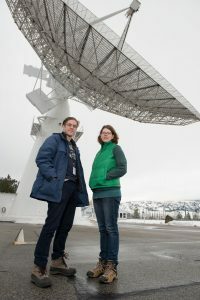 The Newburgh lab builds instruments to chart the past 13 billion years of cosmic history: measuring the Cosmic Microwave Background with millimetre-wave telescopes and Large Scale Structure with radio telescopes. The resulting data sets will probe the nature of Dark Energy, Dark Matter, the sum of neutrino masses, and cosmic inflation. I am currently taking students to work on a variety of hardware projects as well as CHIME data analysis. 2004 - 2010: Columbia University, Ph.D.
1999 - 2003: Barnard College, B.A.